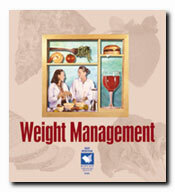 An ideal resource for weight management and general health promotion. This kit contains resources for a complete weight management information program, including articles on eating triggers, meal planning, food labels and tips on preparing tasty, low-fat meals. This kit is one section of the more comprehensive Stress, Heart Health and Weight Management Kopy Kit, which is also available in CD-ROM format. Weight-How Much Is Too Much? Should You Put Your Kids on a Diet? The Power of "Conscious Eating"
Can You Really Eat More and Weigh Less?